Today was Module 2 of The School for Change Agents - it was all about the power to make a difference. Wow, what a buzzing session it was again! The focus of Module 2 is power - do we feel we have power to influence and effect change? Often, the systems in which we work can make us feel like we need to ask for permission to act; our creativity or sense of our own ability to try something new can be stifled. 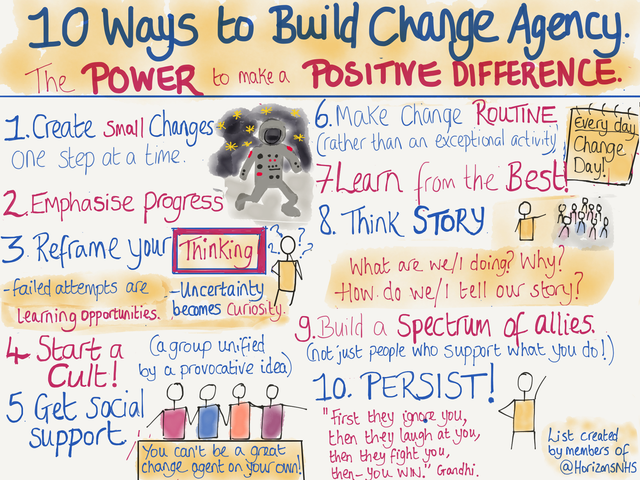 Unfortunately, this means that while many people would like to make change happen, they feel they lack the requisite power - that's why the Horizons team set up The School for Change Agents. The good news is, we all have within us the power to influence and effect change. We can all, should we want to, build our own sense of agency, contribute to positive change, and help make a difference. 1. Create small changes - one step at a time - remember how you eat elephants (don't worry, they're metaphorical)! 2. Emphasise progress. Change can often take a long time to effect, and there will be times when you feel disheartened. Remembering how far you have come, and recognising your progress will help you to keep going. 3. Reframe your thinking! Many of us are hard-wired to believe that failure and uncertainty are scary and wrong. Change happens outside of our comfort zone, so we need to change the way we think...for example, failure provides us with learning opportunities, and uncertainty can become curiosity about the world of possibilities. 4. Start a cult - a group of people unified by a provocative idea. It's about finding your people, harnessing your shared power, abilities, and experiences and working together to make change happen. 5. Get social support - you can't be a change agent on your own! Make connections with people in your organisation, and/or make use of social media to find like-minded people. You can provide mutual support to one another. 6. Make change routine, rather than an exceptional activity. We're all changing and evolving. Always be contemplative, explorative, curious! 7. Learn from the best - do some research and find out how someone you admire achieved their goals. If possible, reach out to them and ask for advice - most people are happy to help and advise. 8. Think story - what are you doing. Why are you doing it? How will you tell your story, your narrative in a way that draws people in, and compels them to take action? 9. Build a spectrum of allies - and not just the people who support what you do! It's natural to connect just with your friends, but thought diversity is really important. Don't dismiss people who disagree with you - engage with them. They can have some crucial points that help you move towards achieving your goal. 10. Persist! Achieving successful change takes time, and you're likely to experience hurdles and mishaps along the way. Pick yourself up, and keep going. As Gandhi said, "First they ignore you, then they laugh at you, then they fight you, then you win!"